THERE is a billiard-room in the Strand where I frequently play a game with a friend, and some­times with the marker. I came from my chambers one evening, and walked slowly to­wards the Strand. Presently I bethought me of the billiard-room, where I had played more than once with Boyd at about this time. As I turned in at the door a very wretched-looking man stopped me. His rusty black coat was fastened—with a pin, I think—close under his chin, as is the way with very seedy people who have no shirts. He wasn't dirty—indeed, I should think he was as well-washed as I was myself—but he was unhealthily pale and terribly thin and bony. He said, "I beg your pardon, sir, but your friend isn't in the rooms, and the marker is playing with another gentleman. 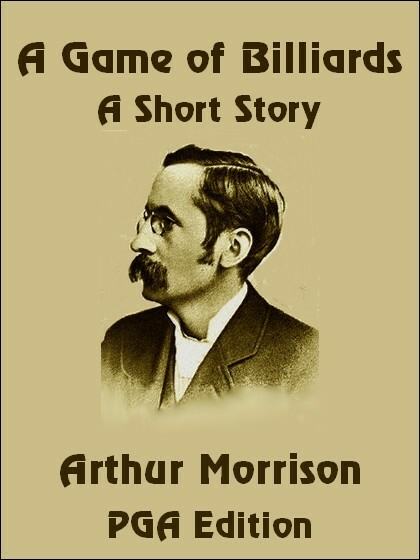 If you'll play me a game, a shilling to nothing, sir, I'll give you a good game—I will indeed!" I had no particular ambition to play with this ill-clad scarecrow, and I judged his address to be merely a form of begging. But when I reached the landing and pushed open the billiard-room door, I found the man at my elbow. "For the love of God, sir," he pleaded, "Let me play you—a shilling to nothing! You'd probably give the marker a shilling if he played with you. Give me a chance of it, and I'll give you a good game—I will indeed!" "Outside, there, please!" the marker cried, looking up from a stroke. "Outside!" "I'm to play with this gentleman," the man answered desperately, with on appealing look at me. "All right," I said, "but only fifty." The marker seemed not altogether pleased, but he made no further objection, and I took, my cue. The pale man selected his with a deal of care, and I could see that his hand was trembling. That did not look like good billiards, at any rate. I gave the usual miss in baulk, and the pale man tried for the cannon off the red—a very difficult shot. He was hasty and nervous, and he failed badly. I put my ball in the middle pocket off the white, and thus bringing the balls together at the top, I made a gentle cannon from baulk, followed it with another cannon, put down the red, and cannoned again. As I looked up from this stroke, the man's face almost broke up my nerves. His eyes were on the balls, and the sweat stood on his face as though sprinkled from a brush. Plainly, I was playing better than he expected; though I never saw a man so anxious, over a game—or a shilling. So much was I startled by the fellow's aspect, that I made a bad mess of the next stroke—a very easy one, to pocket the red—and felt angry. He passed his tongue nervously over his lips, squeezed his eyes tight for a moment, as though they ached, and then put his ball in off the red. It was a very easy stroke, but it seemed to quiet his nerves a little. So much so that he went in and scored seven with the next three shots—a break of ten. But at that he left himself nothing, and failed; still, it was plain he was no duffer, though his nerves were all to pieces. "Would you like to make it a hundred, sir?" he asked. I resolved to muff my other strokes and let the poor devil win the shilling; but some perverse fate wouldn't let me stop scoring as I wanted. I needed six to win; and he needed seventeen. He made a couple of cannons, and then at different times went in off white and put down red. This left him eight to get, against my six. And then I, anxiously trying not to score, went in off the red—the blankest fluke in the world. Worse; this left the balls far apart, and thinking to bring them all down together in baulk for him (his own ball lay in baulk), I made a hard drive up at the red, brought it down as I wished—and cannoned! My score was forty-nine, and the pale man's ball lay close under the cushion. His game was desperate. It seemed impossible for him to score, and, agitated as he was, it was more than likely that with his ball so tucked away he would make a miss, and so give me the game As he turned to chalk his cue, I took the opportunity to slip a shilling on the edge of the table just over his ball, and then turned my back to get my hat and pay for the game. If he made no miss I would plead an engagement and give him the game and the shilling; if he did—well, he'd probably make no difficulty in taking the money. But a smart double click of the balls caused me to turn my head; and behold! only my own ball stood on the table. It was a cannon and double pocket, scored eight, and won the game. "Good stroke!" I cried. "Capital stroke!" But as I said it the cue rattled down on the table, and the man fell forward over it with his long arms extended. The marker and the man playing with him put down their cues and ran to help me lift him. "Not drunk, is he?" said the marker. Of course, I knew he was not drunk. We put him lengthwise on the cushioned seat that extended the length of the wall, and then something prompted me to tear open that pinned-up coat. Not only had the man no shirt, but also no waistcoat. I put my hand to the bare and very shrunken chest, and could feel no beating. "Fetch a doctor!" said the man from the other table. But the shabby man was dead. Nevertheless, in ten minutes the doctor was there; but he could only do as I had done, and shake his head. "Heart, no doubt," was all he said "Know who he is?" The marker knew the man by sight, and also by name—Viney. He had been well off once, the marker believed, but he had had bad luck, and turned billiard-marker some years back, but had had no work for a long time. He bad tried to earn a few coppers at odd jobs, but had very little luck, the marker thought—not being strong. The marker knew nothing against him, but he had had very little luck, the marker thought—not being strong. The marker knew nothing against him, but he had orders to keep out loafers. Ho fancied he lived somewhere about Russell Court in Drury Lane, and that he had a wife and children. But they would be sure to know at the public-house at the corner of the court, for he sometimes earned a copper by helping the potman clean the pots and cans. I looked for the shilling, but it was gone. Nothing whatever was in the man's pockets, and there was no shilling on the floor nor on the table. It could not have rolled down a crack for linoleum covered the floor closely; and indeed I remembered that the poor fellow had fallen over the place where I had put it, and that I had heard no jingle such as would have been caused by its striking the floor. The marker could not have taken it without my seeing him, even if he had not been, as I believe, a very honest fellow. No money of any sort was on the corpse; so I let it go, and came away. The potman at the public-house in Drury Lane knew Viney very well, by name as well as by my description, called him "a pore bloke," and said that he and his wife and two young children had been pretty near starvation for a month or more; and the wife, moreover, was ill with an ulcerated leg. They lived in the top-floor back-room of a wretched house; to which the potman directed me, in one of the dirtiest courts behind Drury Lane. I climbed the dark stairs as best I could, shrinking from the filthy, sticky hand-rail at first, but soon glad to grasp it to save my shins on the broken steps. At the very top I paused, for here at last funked my mission, and doubted what to do or say. But the thing must be done, and I knocked at the door. "Come in!" The voice was a woman's, and very weak. I pushed open the door. Dusk was not begun, and the room was fairly light. Opposite, on the floor, scarce covered by a miserable rag bed, lay the most wretchedly sickly-looking woman I ever saw, with two small children beside her. "Mrs. Viney?" I asked, and she answered, "Yes, sir," looking a little more sickly, I fancied, from apprehension at my visit. I began very hesitatingly. "I'm afraid, Mrs. Viney, your husband is—is rather ill. He—"
The woman almost rose in her agitation. "Where?" she asked. "What is it? Just now?" "When I left him," I said, "half an hour back, he was very ill."
"But I've seen him since that," the woman said, wide wonder in her sunken eyes. "He came in five minutes ago, and went out again without a word; but he left this." She opened her hand, and in its palm there lay a shilling.